Given Gucci's history, therefore, it is not surprising that the company has launched an immersive retail experience for its customers. Thanks to the latest technological innovations, Gucci's customers can experience an interactive, immersive type of engagement that has been previously seen only with limited use in theme parks and other entertainment venues. There are several reasons to employ natural user interfaces (NUI). By mimicking gestures that people use every day -- pointing, pushing a button, swiping their hands -- for a variety of reasons, the interfaces eliminate the need to learn new skills to operate an interactive display. Customers can spend more time interacting with the display and less time typing instructions or searching for a clickable link. Gucci's displays are highly interactive and put the customer in control. Customers choose the types of products that interest them, but they also choose how many times they view the same item, which angle to freeze and other details. Passive displays, in which the customer is nothing more than a spectator, do not provide the same level of engagement. However, an interactive display that makes proper use of images can tell a story quickly while still conveying the nuances. As a rule, romantic restaurants do not feature bright, harsh fluorescent lights, paper tablecloths or loud music. They are more likely to feature soft lighting, cloth table linens and soft instrumentals playing in the background. The word is "ambience," which means the overall mood or feeling of a location -- sometimes called its aura. 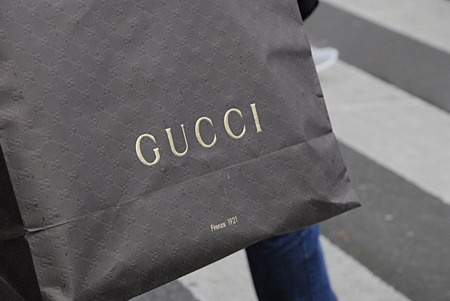 Gucci could not create a successful immersive experience if the store's carpet was worn or stained, sales personnel were improperly dressed, staff members treated customers rudely or merchandise was not displayed properly. Every detail of the store becomes part of the customer's experience, so Gucci pays special attention to even the smallest. The world of retail is highly competitive. Today, customers realize the power they have over merchants, and they expect a certain amount of pampering from retailers who want them as lifetime customers. In the world of Gucci, merely telling a customer that a product is out of stock is not acceptable. Arranging to have the desired item delivered to the customer's home or finding a suitable alternative product is the more likely scenario. Customers can get Saturday delivery or free returns for their online purchases. In short, Gucci is willing to take the extra step when it is needed to enhance the customer's experience.